More than a dozen of the company’s Wisconsin employees were able to join in the celebration, which featured reminiscences from company founder Dave Grumman and early leaders Al Butkus and Jeff Conner. G/BA was founded in May 1973, as Enercon, Ltd.: a one-person energy consulting firm based in Evanston. Initial commissions consisted mainly of energy management studies, energy grant applications, and energy consulting services. During the following decade, the firm grew and expanded its capabilities to include design of retrofits for implementation of energy conservation measures recommended in its studies, plus remodeling and renovation of mechanical/electrical systems in large buildings. In 1981, the name “Grumman/Butkus Associates” was adopted with the promotion of Al Butkus to company principal. Also that year, G/BA opened an office near Milwaukee in Wauwatosa, WI, headed by Jeff Conner. The Wisconsin operation eventually expanded to include a branch in Madison. A New York regional office, G/BA Commissioning Services, was opened in 2013 in Hoboken, NJ, reflecting growth in the overall commissioning and retro-commissioning markets. A small Florida branch of G/BA was added in 2017. Today, a majority of the firm’s work involves MEP design, including infrastructure assessments and upgrades, building renovations, new construction, commissioning, and retro-commissioning services. Experience in energy efficiency and management has also built the firm’s technical consulting expertise for sustainable design certification programs such as LEED and Green Globes. Key market sectors include healthcare, higher education, hospitality, science/technology/pharmaceutical, commercial/industrial, multifamily residential, senior living, government, cultural, and data centers. 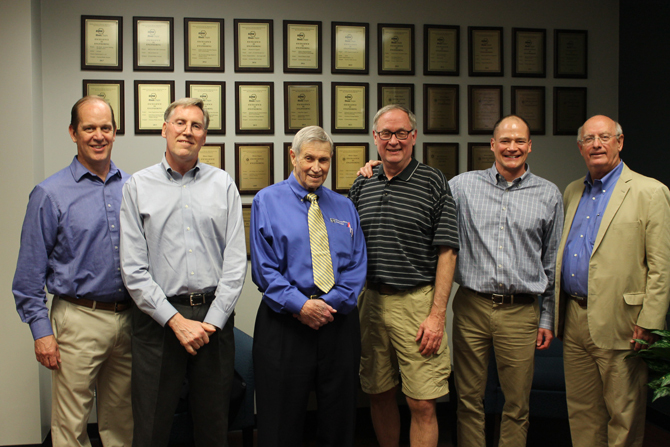 Left to right: Bob Bayne, President-Wisconsin; Dan Doyle, Chairman-Illinois; Dave Grumman, Founding Principal; Al Butkus, Founding Principal; Chad Luning, President-Illinois; Jeff Conner, Chairman-Florida/Wisconsin.